A devastated couple who should have been sunning themselves in Tenerife, had to cancel their £1,400 holiday plans yesterday after their house was flooded – for the third time in eighteen months. As floods hit the region for the second time in seven months, the couple found themselves bailing out their homes once again. Pensioners Sheila (69) and Jack Lockwood (77), of Chesswick Crescent, Keadby, who have lived in the house for 42 years should have been going through customs early yesterday but instead were piling sandbags around their house. “We should have left for the airport at 5am but I’ve been up most of the night because I could hear the rain and knew we’d be flooded,” said Mrs Lockwood. The couple, who were hit by flooding in the summer, said it was upsetting they were in the same situation again. 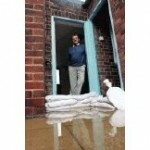 “All the repair work has only just been finished from the summer floods about three months ago and here we are again. It’s devastating and every time you see the weather it’s all panic,” said Mrs Lockwood. The flooding comes only months after the region was plagued with water in June.